Use the Liberty 1-3/16 in. 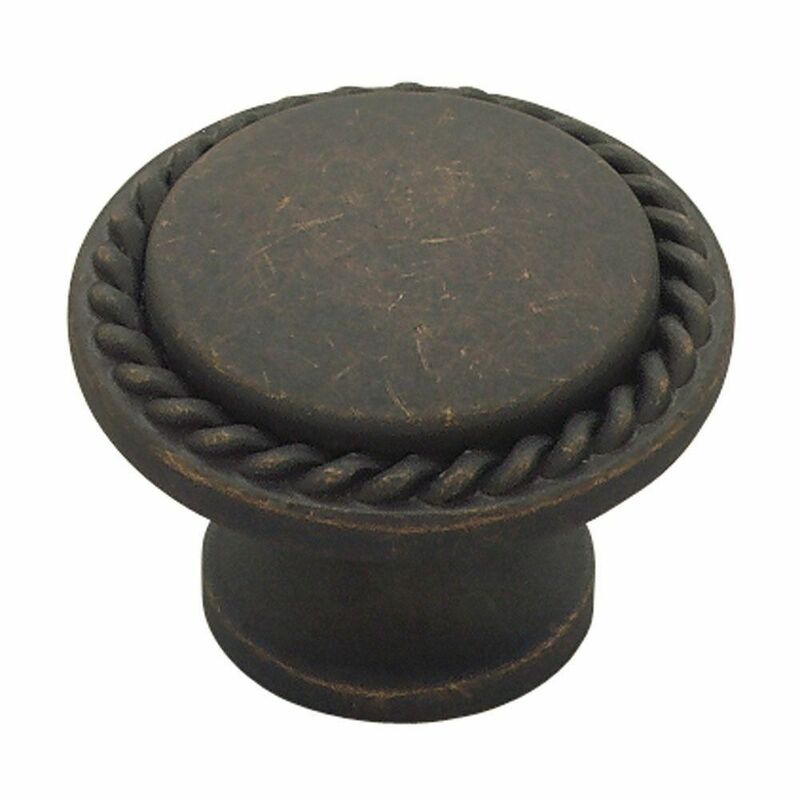 Distressed Oil-Rubbed Bronze Rope Edge Cabinet Knob to enhance the appearance of your indoor living space. The striking finish helps provide a stylish and easy update for your kitchen decor. The Amerock TEN53002ORB Allison Value 1-3/16in(30mm) DIA Knob is Finished in Oil-Rubbed Bronze and comes in a pack of 10. From rustic to modern-day casual to sophisticated beauty, The Allison Value Collection offers a variety of designs, making on-trend, quality hardware affordable. The Oil-Rubbed Bronze finish is a rich, dark brown old world finish with striking light and dark accents. The Amerock BP3650ORB Carolyne 1-3/8-inch (35 mm) Dia Knob is finished in Oil-Rubbed Bronze. Elegant beading adds visual interest to our Carolyne collection; making each piece exquisite. Bright and polished or strong and subdued - you'll have your pick of gorgeous and stately finishes with this selection of knobs and pulls. The Oil-Rubbed Bronze finish is a rich, dark brown old world finish with striking light and dark accents. Amerock markets decorative hardware solutions that inspire, coordinate and help express personal style. For the kitchen, bathroom and the rest of the home, with a variety of finishes and designs for all decorating tastes, Amerock is the ultimate, time-tested source for hardware needs. Amerock markets products in four categories: decorative hardware, decorative hooks, bath accessories and functional hardware. The Amerock Esquire 2-5/8-inch (67 mm) LGTH T-Knob is finished in Oil-Rubbed Bronze. Innovative, groundbreaking ideas are the inspiration that drives Esquire. This striking mixed media collection pairs upscale finishes with textured accents that puts any room on the cutting edge of design. The Oil-Rubbed Bronze finish is a rich, dark brown old world finish with striking light and dark accents. Amerock markets decorative hardware solutions that inspire, coordinate and help express personal style. For the kitchen, bathroom and the rest of the home, with a variety of finishes and designs for all decorating tastes, Amerock is the ultimate, time-tested source for hardware needs. Amerock markets products in four categories: decorative hardware, decorative hooks, bath accessories and functional hardware. 1-1/8 Rope Edged Knob, 1 per package Use the Liberty 1-3/16 in. Distressed Oil-Rubbed Bronze Rope Edge Cabinet Knob to enhance the appearance of your indoor living space. The striking finish helps provide a stylish and easy update for your kitchen decor.